in true anCnoc style, offering a traditionally distilled, exquisite spirit with a modern twist. It follows a string of highly successful new releases and is expected to be just as popular. 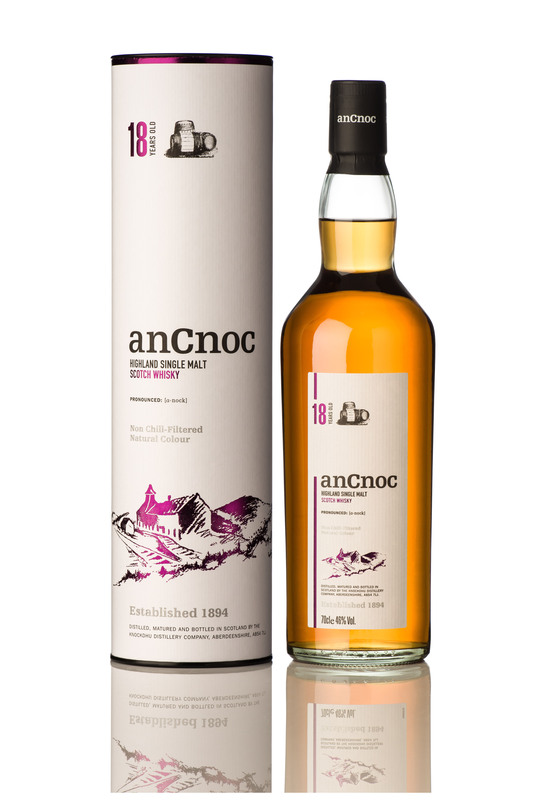 anCnoc 18 Year Old was matured in top quality hand-selected American oak ex-bourbon and European oak ex-sherry casks. The combination of the two types of wood gives this mature expression of anCnoc an outstanding depth, complexity and balance of flavour. It’s a single malt for the most discerning drinker. The whisky is bottled at 46% ABV, non-chill filtered and presented at its natural colour. Initially 6,000 bottles will be available in key markets worldwide. The recommended retail price is £70. Gentle spices and intense sweetness of dried fruits are topped with silky chocolate ganache, a squeeze of ripe orange and a mere suggestion of oiled leather. Intricate and elegant, balancing both maturity and Distillery’s signature character. Full-bodied and bold, the palate brings aromatic spices, fruit loaf and candied lemon slices followed by a surge of vanilla custard, honey and runny caramel. European and American casks play in harmony delivering a lush and irresistibly moreish drinking experience while retaining anCnoc spirit firmly at the heart of this whisky. Long and rewarding, the finish transforms from peppery and hot to deliciously sweet and smooth with an undertone of bitter pralines.